Rosin has become a hugely popular extraction method, not only because it’s really easy to carry out and completely safe, with no risk of explosions or fire, but also because of the purity of the results, giving clean cannabis concentrates produced using only heat and pressure, totally free of solvents, and within the reach of everyone. With this growth in popularity, the number of purpose-built presses on the market has increased hugely over the last year, with a wide range of different sizes, styles and prices available to the budding extractor, depending on his or her requirements. In posts over the last few years we’ve shown you how to make rosin from flowers and then from hash using a simple electric hair straightener, a great and inexpensive way to get started in this world of solventless cannabis extractions. But now it’s time to look at how to extract on a larger scale, using a hydraulic press and heated aluminium plates. The principals of the extraction process are the same, as are the variables to control: temperature, pressure and time. However, things are a bit easier in the case of a professional press, we’ve got more pressure at our disposal, the temperature of the plates should be more accurate and reliable, and we’ll also have larger plates with greater surface area, meaning we can press more each time. If you’ve ever pressed an ounce of flower with a hair iron, squishing 1 gram at a time, you’ll know what I mean! With a good rosin press we can comfortably press an ounce of flowers (or more) in one go! When we press rosin, the idea is to get as much resin out of the starting material as quickly as we can, and at as low a temperature as possible. This is because heat naturally reduces quality, evaporating volatile terpenes and oxidising cannabinoids. We should be aiming to extract all of the rosin in the first press, rather than having to repress the material for a second time, with inevitably leads to a decrease in quality, producing darker coloured resin with a lower content in terpenes. For this reason it’s well worth taking notes for each strain processed and performing a few test presses on the material to “dial in” the temperature and timing variables for maximum efficiency in the extraction, and to find the perfect balance between yield and quality. Pressing at high temperatures will extract more oil, but of a lower quality as the heat evaporates terpenes and increases oxidisation, whereas pressing at a low temperature will extract a lesser quantity of more highly-flavoured resin extract, giving slightly lower yields in favour of superior quality. The decisive factor in a successful Rosin extraction is the quality of the starting material, we should use only the best material we have if we want a top shelf concentrate at the end of the day. As with many processes, preparation of this high grade material is key to success and shouldn’t be rushed. Taking the extra time to properly prepare before pressing will be rewarded with consistently superior results. The first step in preparation is proper storage, and to optimise quality, the material, whether it’s flowers or hash, should be preserved in airtight containers at a low temperature and protected from light. In the case of flowers, maintaining the correct humidity is vital, so many extractors use Boveda humidor packs to keep the buds at 62% RH, the perfect humidity level for making rosin. 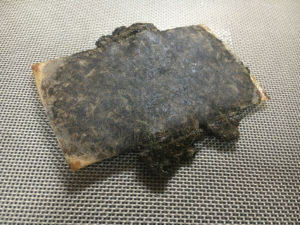 The packs can be re-used many times and are essential for anyone serious about making flower rosin. When pressing rosin from hash however, humidity is less crucial, although it’s just as important to store the hash properly before pressing to preserve the terpenes and cannabinoids from unnecessary degradation. So, now we’ve got the material in optimum condition, next it’s time to load the rosin bags. These are mesh bags available in different sizes according to the measurements of the heated plates being used and in different mesh sizes, depending on the application needed. They serve to contain the starting material being pressed, while allowing the clean, uncontaminated rosin to seep out through the tiny holes measuring between 25 and 220 microns. For pressing flowers we recommend a mesh size of between 73 and 220 microns, and for hash it’s best to use a mesh from 25 to 45 microns in size. To prepare the buds for stuffing into the bags, first break them up and remove any non-resinous leaves and as much of the stem as possible. Not only could the stems damage the filter bag, perforating it under pressure, but any surplus, trichome-free vegetable matter will only serve to absorb the liquid resin once it heats up, thereby reducing our yield. There are two ways to fill the mesh bag with flowers, depending on how much material we’re processing. If you’re going to be using the press for regular production we highly recommend using a pre-press mould, which enables us to quickly and easily compress the flowers into a firm, solid brick that’s the perfect size to slip inside the mesh bag, saving time and effort. In a perfect setup, the pre-press process would be performed using a small 1 ton arbor press or a Quick-Clamp type of hand clamp, but failing that, we can use our own body weight, stepping on the pre-press with the heel of a shoe. Remember to line the inside faces of the pre-press device with parchment so the compressed flowers won’t stick. If not using a pre-press mould, we can fill the bag by hand. This way will take longer and we’ll only be able to fit about half as much flower in each bag, but the quality and return are comparable using either method. When filling by hand it’s crucial to leave as little empty space as possible between the buds inside the bag, so break them into smaller chunks to fill the corners and edges, compacting each layer by hand as we progressively fill the bag, remembering to leave enough empty bag at the top to allow us to fold it over to close it. While a pre-press mould may be useful, it won’t be absolutely necessary when working with bubble hash or dry sift, simply fill the 25 – 45 micron bag with your chosen resin, making sure all the corners are filled properly, then press the filled bag lightly by hand to flatten it before squishing. In the case of preparing multiple bags for batch pressing, we can store the filled mesh bags with a boveda pack inside a jar, container or plastic bag until we’re ready to press. This ensures that all bags remain at optimum humidity levels, helping us to achieve consistent results when pressing. If you’re working on a hot day, keep the filled bags in the fridge too. 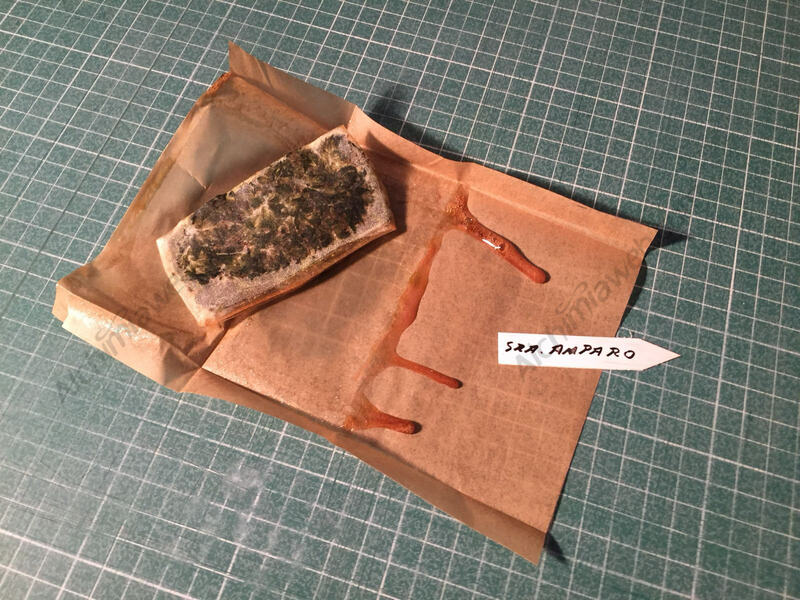 Rosin is always pressed using non-stick parchment paper, which as well as making it easy to recuperate the resin once the extraction is done, also keeps the heated plates clean and free from sticky residue, saving maintenance work. 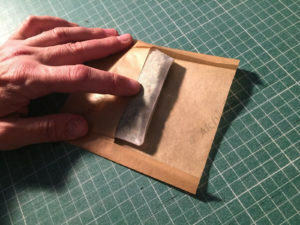 Pressing rosin can be as simple as placing the filled mesh bag between two sheets of parchment, applying pressure, and allowing the resin to seep out of all four sides of the bag onto the paper. 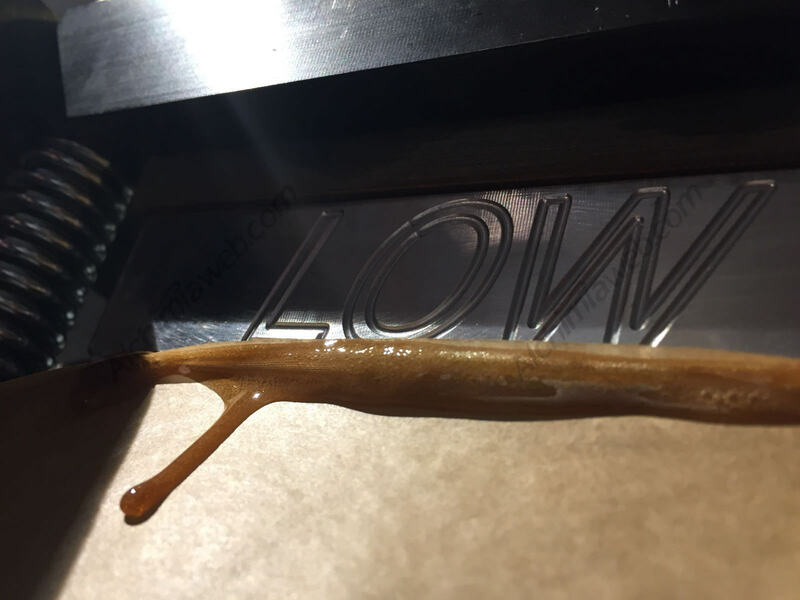 The disadvantage here is that some of the rosin, once it seeps out of the mesh bag, will still stay in contact with the heated plates and will lose quality as a result. To avoid this we can fold the parchment in a way that expels the rosin from the front side only, taking it away from the heat. Sometimes referred to as “Burrito-tech” as it resembles a folded tortilla closed on three sides, this technique gives us more control, allowing a much better view of the extraction, which enables us to see the resin begin to flow, and then observe when it slows at the end of the process. If you’re using a table-top press, make sure you place it on a sturdy desk or table at a comfortable height for working, ideally with the plates situated at eye-level for comfort. A free-standing press will need a flat, level floor that’s sturdy enough to take the weight, which can be considerable. Once you’re happy the press is safely installed, you can plug in the heaters and set the desired temperature for the plates. Some models have dual controls, allowing you to set each plate at a different temperature, while others only have one controller to set the same temperature on both plates, which in our experience is works perfectly well and keeps things nice and simple. The correct temperature to press at will depend on a variety of factors, taking into account the type of material – hash or flowers, and the quality, age and condition of said material, and even the relative humidity and temperature of the space in which we’re working. Each variety, phenotype and batch will be slightly different, but as a general rule when pressing older, dryer flowers, we’ll will need to use slightly higher temperatures for a satisfactory extraction, while relatively fresh material can be processed using less heat, thus preserving the greatest amount of terpenes possible. The same goes for making rosin from bubble hash or dry sift: the better the quality of the starting material, the lower the temperature we can use. We recommend pressing in a range from 85ºC to a maximum of 110ºC for flowers, and to set the heaters to a temperature between 65ºC and 105ºC when pressing hash, depending on the quality of the starting material. 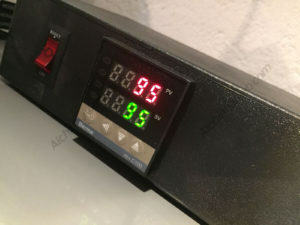 Using these guide temperatures as a starting point, you can experiment to find the perfect balance between high returns and optimum quality, always remembering what we’ve stated above: that each batch of each strain can behave in a slightly different way and that ambiental factors can also impact on pressing temperatures. If desired, we can verify the temperature of the plates using a contact thermometer or a digital thermometer with a leaf probe. Infra-red/laser thermometers won’t be able to give an accurate reading as they don’t work properly on reflective surfaces. In any case, the press should be fitted with a perfectly accurate thermocouple which, if fitted properly, will provide us with the true temperature of the plates and allow the controller to adjust the heat automatically. The press shouldn’t take more than a few minutes to heat up to the desired temperature, and with the filled mesh bag in the parchment pouch we prepared earlier, we can begin the extraction process. 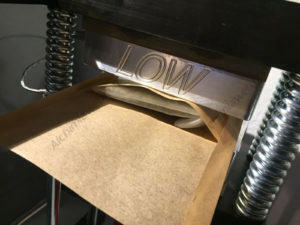 Place the bag and parchment centrally between the heated plates, making sure all parts of the mesh bag are within the surface area of the plates. When we’re satisfied with the position we can start to close the plates until they begin to apply slight pressure, just making contact with the bag and squeezing it ever so slightly, then stopping to wait a moment before continuing. This short period of pre-heating the material helps the resin flow easier and greatly reduces blow-outs. In the case of flowers this takes around 10-20 seconds, but if we’re pressing hash we should wait a little longer, until we can see a little bit of liquid rosin forming at the front of the bag. Now we can start to increase the load on the press gradually until we reach our maximum desired pressure (See below for a word on this subject, but more isn’t necessarily better). With the material heated and under full pressure, it won’t be long before we start to see the melted resin dripping out from between the plates. All we need to do now is watch carefully, waiting for the flow of rosin to slow down and stop completely. This will take anything from one to five minutes, depending on the quality of the starting material and the temperature being used. Once you’re happy that no more rosin is coming out, it’s time to release the pressure and open the plates to retrieve the parchment paper with the mesh bag and rosin on it. Now just let it cool to allow the rosin to solidify (Placing it in the fridge for a few minutes is usually enough) before starting to collect it from the parchment. After a few minutes in the fridge, the rosin should be solid and ready to collect. This can be done with a dabber, carefully scraping the parchment and accumulating the rosin on the dabber tip, before transferring it to a glass jar, silicone pot or oil slick paper for convenient storage. Depending on the temperature used and freshness of the flowers, some cannabis varieties produce a very runny, sappy texture of rosin that can be a challenge to collect, as it won’t solidify in the fridge, and even placing it in the freezer doesn’t help much. In these cases we can use an object with a flat surface that’s been kept cold in the freezer, for example a thick plate, or an ice-pack. By placing the parchment with the sappy resin onto this cold surface, we can make collecting much easier and a lot less messy. After collection we recommend storing your rosin in the fridge to best conserve the aromas and flavours. 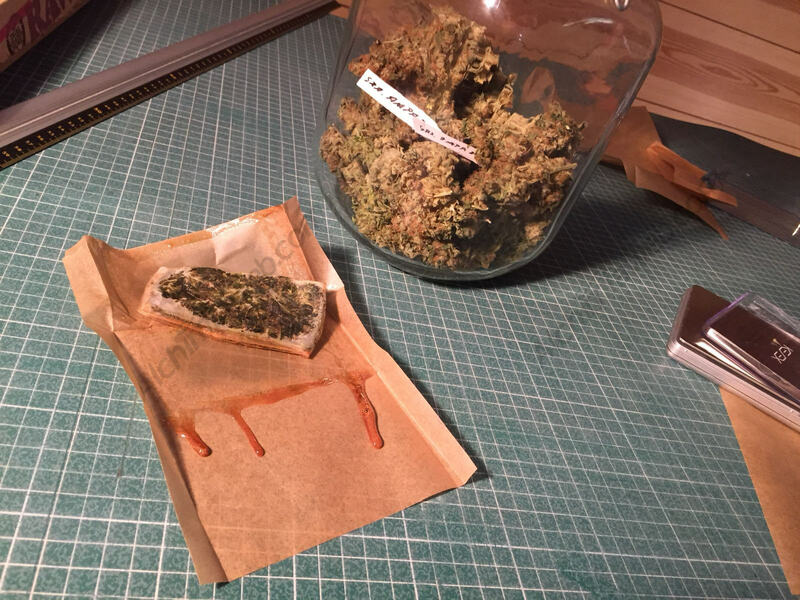 When you take your concentrate out of the fridge, allow it to warm up to room temperature before opening the container, otherwise any humidity in the air will condense on the Rosin, which can affect quality and lead to the extract hissing and “spitting” steam when dabbed on a hot nail. 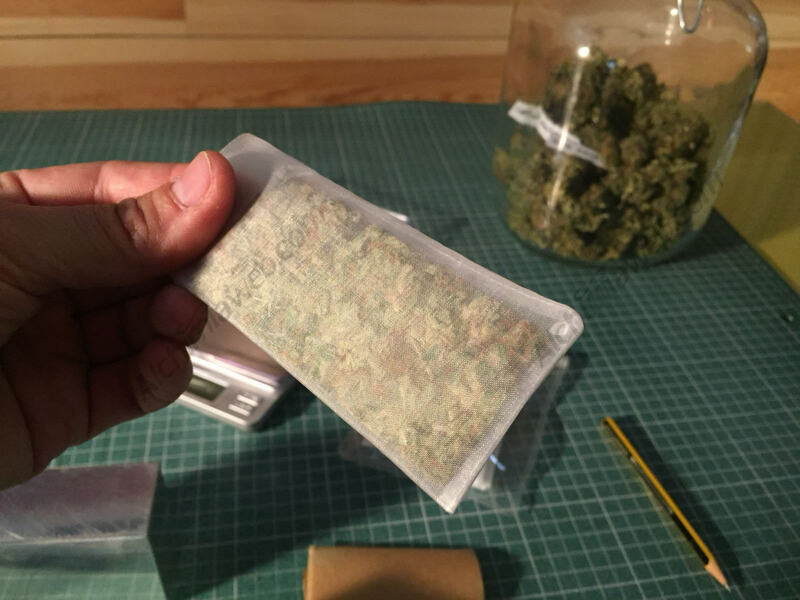 The filled rosin bag that we’ve just pressed will still contain a certain amount of resin, we can discard this if we want, or we could do a number of things with it to avoid wasting cannabinoids that could still be useful. We can either press it for a second time, which would extract a small amount of darker rosin that would be ideal for making edibles, or we could extract the oil via maceration the bag in ethanol or olive oil, for example, to make tinctures or oil for cooking. One we’ve got the temperature and timing dialled in, a blow-out is pretty much the only thing that can go wrong when pressing rosin. 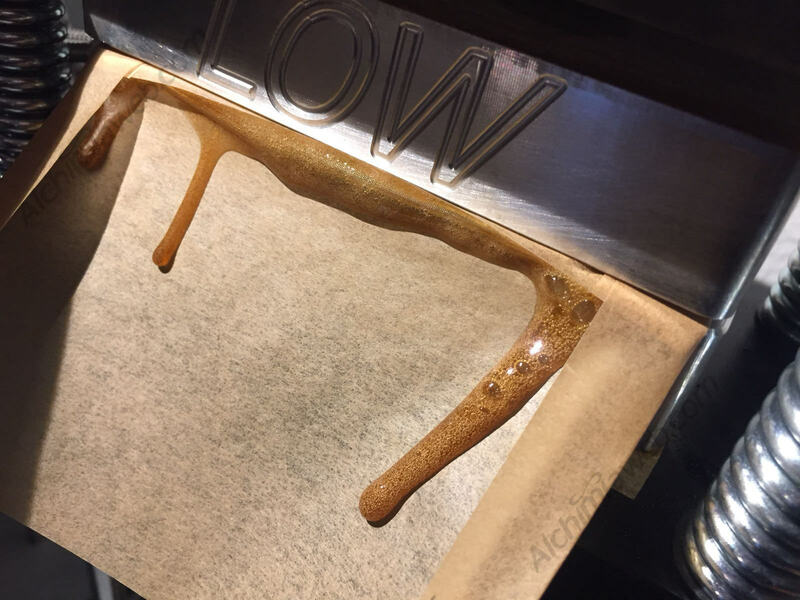 This mostly occurs while pressing rosin from hash, when too much pressure is applied to the bag too quickly, rupturing the seam and spilling the unfiltered hash out onto the parchment paper. It’s important to avoid this not only because the blow-out will potentially contaminate the rosin already extracted from the bag, but it also means that to salvage the escaped hash and get any more rosin from it, we’ll have to re-pack it into another bag and press it again. In this case the degradation of the cannabinoids and terpenes resulting from heating up twice will mean our extraction will lose a great deal of quality, be significantly darker in colour and have a much less attractive aroma. Blow-outs can also occur when pressing flowers, but they rarely cause the same problems as with hash, not contaminating the rosin to anywhere near the same degree. We can help to minimise blow-outs by doing three things, firstly don’t over-fill the mesh bags, secondly, use a second, larger mesh bag with hash presses, as outlined above, and lastly, apply pressure gradually and slowly, allowing the material to heat up before giving full pressure. 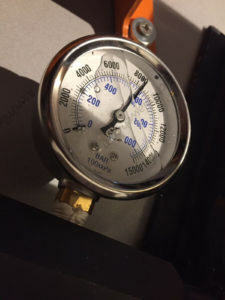 Contrary to popular opinion, more pressure isn’t necessarily better. It’s important to have adequate pressure to be able to extract the maximum amount of resin from our starting material, but there’s no need to have, for example, 30 tons of pressure on 3″ x 7″ plates. It is quite widely accepted among experienced extractors that the maximum pressure necessary is around 1000 psi at the point of contact. Applying more pressure than this will force out other, less desirable compounds from the plant material, e.g. chlorophyll, fats, waxes and lipids that, while they may add to the overall yield weight, will decrease the quality of the final product. We can easily calculate the required pressure by measuring the dimensions of the filled mesh bag being pressed (not the dimensions of the plates). Therefore, if we’re pressing a bag of 2 x 4 inches, it has a surface area of 8 square inches, so to apply 1000 psi to it we would need 8000 pounds of pressure, or just 4 tons. 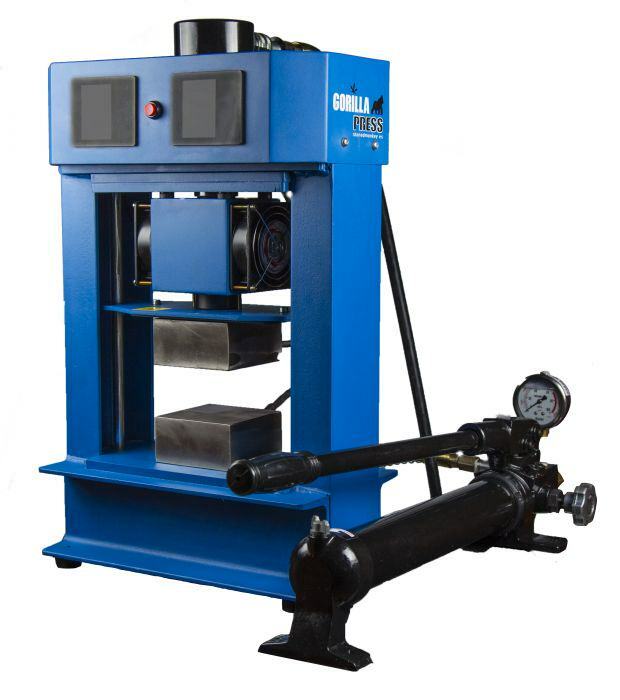 Bearing in mind that, for safety reasons, we should only use a hydraulic press to a maximum of 80% of it’s capacity, we only need a 5 ton press to effectively use 3″ x 5″ plates, which is the most common size on the market today. Previous ArticleWhat’s The Evidence That Hemp Could Be Useful In Treating Cancer?